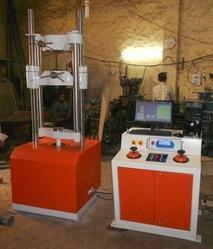 Our product range includes a wide range of universal computerized testing machine. Universal Computerized Testing Machine is used to determine various types of strength Tensile, Compression, Bending/Transverse, and Shear. The operation of a machine is by the hydraulic transmission of load from the test specimen to a separately house load indicator. The system is ideal since it replaces transmission of load through levels and knife edges, which are prone to wear and damage due to shock on the rapture of test pieces. Displacement of the pendulum actuates the rack and pinion mechanism which operates the load indicator pointer and the autographic recorder. The deflection of the pendulum represents the absolute load applied on the test specimen. This consists of a hydraulic cylinder motor with chain sprocket drive and a table coupled with the ram of the hydraulic cylinder. mounted onto a robust base. The cylinder and the ram are individually lapped to eliminate friction. The upper cross-head is rigidly fixed to the table by two straight columns. Tension test is conducted by gripping the test specimen between the upper and lower crossheads. Compression. transverse, bending. shear and hardness tests are conducted between the lower cross­head and the table. The control panel consists of a power pack complete with the drive motor, oil tank, control valves, a pendulum dynamometer. a load indicator system and an autographic recorder. The power pack generates the 2 maximum pressure of 200 kg/cm. The hydraulic pump provides continuously on- pulsating oil flow. Hence the load application is very smooth.